Also called: Champlain leaving Quebec, a Prisoner on Kirk's Ship, 1629. War broke out between England and France in 1628. Quebec was still only a fur-trading post, and the struggling little colony did not raise enough food to support itself, but had to depend upon the yearly supplies sent out from France. 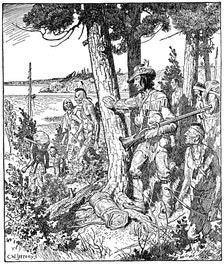 An English fleet intercepted the supply ships, and the colonists were reduced to live upon such food as their hunters and neighbouring Indians brought in from the woods. By the summer of 1629 starvation was near. 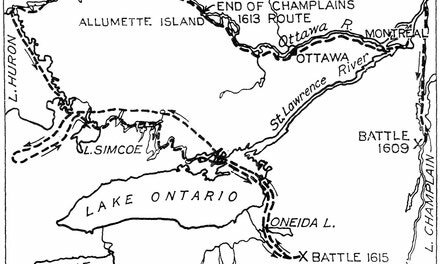 In July the English fleet reached Quebec, and Champlain, short of ammunition, and with a garrison of only sixteen famishing men, had to surrender the post. The English carried the prisoners back to France, leaving a small force to hold the fort and carry on trade with the Indians. 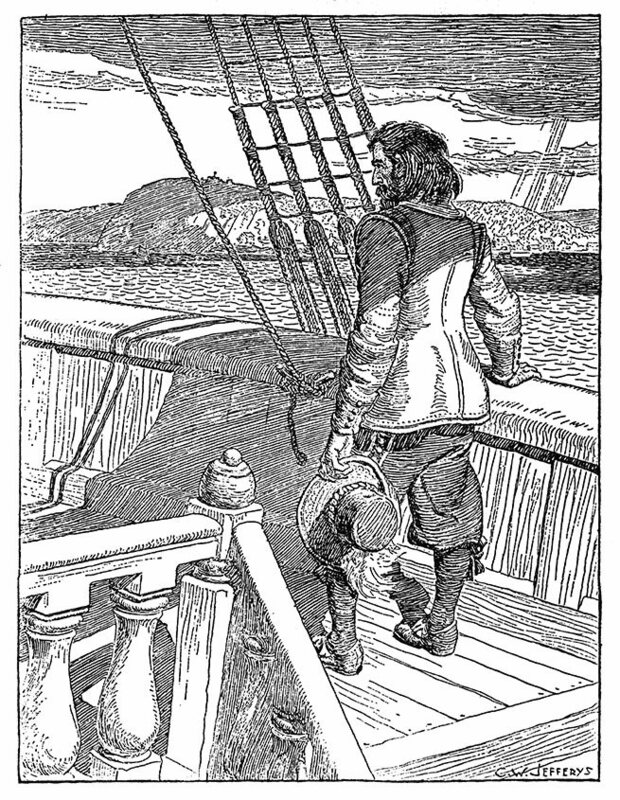 The picture shows Champlain standing on the deck of one of the departing English vessels, gazing at the rock of Quebec where the English flag now flew over the settlement he had founded, and to which he had given twenty years of hard work. Now he was returning a prisoner, and the colony had fallen. It must have seemed like utter failure. The treaty of St. Germain restored Canada to France, and in May, 1633, Champlain was once more back in Quebec. But his work was done, and less than two years later, on Christmas Eve, 1635, at the age of sixty-seven, he lay dead in the fort he had built. Horwood, Harold and Butts, Ed. Pirates and Outlaws of Canada, 1610-1932. Toronto, Doubleday, 1984. 260 p. Illus. Payne, Michael. The Fur Trade in Canada. Toronto, James Lorimer, 2004. 96 p. Illus.